This is our Wildcrafted Helichrysum Immortelle Steam Distilled Essential Oil from only the flowers. Herbal Folk Traditional uses for Helichrysum Immortelle include respiratory complaints, headaches, migraine, liver ailments and skin complaints. 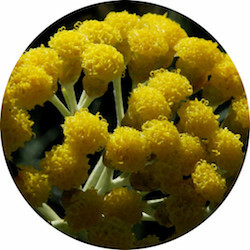 Helichrysum Immortelle is one of my favorite oils! It has a rich floral tea like undertone. Helichrysum Immortelle blends well with Boronia, Chamomile, Citrus oils, Clary Sage, Clove, Geranium, Lavender, Mimosa, Oakmoss, Peru Balsam, Rose Otto and Sage. Out of all the essentials oils that have anti-inflammatory properties, Helichrysum Immortelle has the highest frequency. Whenever I have or had a sore or tight muscle I use Helichrysum on it neat and it loosens right up! In the Winter of 2007 I drove from Florida to NJ, visiting friends and family every where while up there, then back home with only my left hand on the wheel. After arriving home, my upper arm was so stiff and the muscles felt knotted up. I kept thinking this will pass in a day or two. Well it actually got worse over the next couple of weeks. So I decided to put Helichrysum Essential Oil on it daily for about a week. It loosened right up and has never happened again! When I re-started my outdoor workouts back in 2013, Helichrysum Essential Oil worked great on my knees the first week I needed extra support. I applied 2 drops around both knees after drinking my super shake and before my workout with no down time other than usual weekend resting. Helichrysum Essential Oil has been used for hearing loss due to nerve damage. One customer who heard other deaf people experience success, applied it daily around the outside of his ears and inside as far as the pointer finger could fit and in 3 months was hearing through walls, something he had not been able to do since he went deaf when he was 5 years old. Helichrysum Immortelle Essential Oil has the following actions: anti-allergenic, anti-inflammatory, antimicrobial, antitussive, antiseptic, astringent, cholagogue, cicatrizant, diuretic, expectorant, fungicidal, hepatic and nervine.